During last night’s Overwatch League match between the Seoul Dynasty and Florida Mayhem, some Twitch viewers in Australia were presented with an ad from an organisation called Parents HQ. The six-minute video, titled “Queering Children” on YouTube, says that “it’s time for parents to fight back” against gender transition treatments for children, and – among other things – links LGBT advocacy with paedophilia. 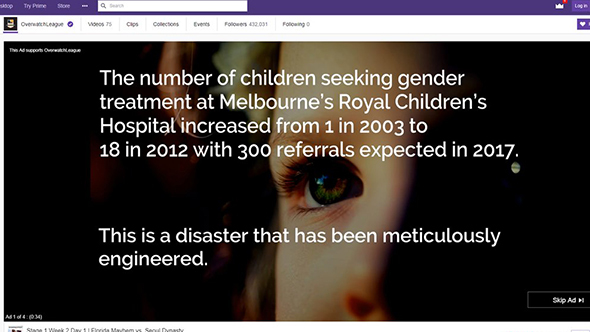 The video is targeted at Australians, referencing MPs there as well as the country’s Safe Schools program, and was seemingly only being displayed in the country. It first came to our notice via Tim Colwill on Twitter. The message in the upper left saying “this ad supports OverwatchLeague” is typical for any ad on a Twitch channel, but Blizzard Australia have been made aware of what’s happened. It’s unlikely that this ad passed by any human eyes at Twitch or Blizzard before the broadcast. Blizzard did not respond to a request for comment from their UK office today, but Colwill received a reply from Blizzard Australia that his information and screenshots would be passed along to relevant parties.